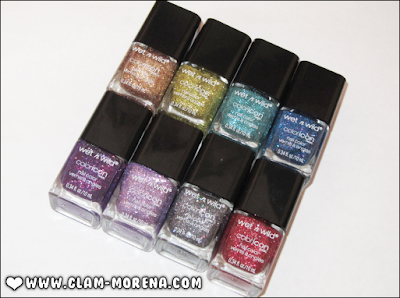 Glam Morena: Wet n Wild Ice Baby Collection. Wet n Wild Ice Baby Collection. One of the most raved about collection from the Wet n Wild Holiday 2011 collections is definitely the Ice Baby Collection! This collection features 8 limited edition Wet n Wild Color Icon Nail Colors. You only be able to find it at Walgreens since this is a Walgreens exclusive collection. Description: Eccentricity is a key characteristic when describing this NEW Color Icon™ Holiday Glitter Collection. The merriment of the season is captured in this gemstone-inspired collection – accented with shimmering tones and bold glitter effects. The unique combinations of glitter sizes and shimmer particles in different shapes and colors give you a jewel-adorned intensifying effect that sparkles and shines! Swatches of the Wet n Wild Ice Baby Collection! Picked up anything from this collection? Favorites? I havent tried these but they look very very pretty!! I've been searching for this collection but no luck yet. Hopefully I will find them soon!